I hope that you are having a fabulous Easter weekend! Mine shall be filled with gardening on Saturday, and church and family meals on Sunday. Don't you love knowing what everyone else will be eating on a holiday? I do. Sometimes knowing what someone else is preparing will spur ideas for me. And sometimes, I just like eating vicariously. So, here's what's cooking in my kitchen on Easter. And for Easter dinner. . . I like to prepare as much ahead of time as possible, so that I'm not spending all my time in the kitchen and away from the rest of the fun. The other day, I stuffed the chicken breasts, rolled up and froze. I'm thawing them overnight in the refrigerator. Tomorrow, I'll bread them and brown in a frying pan, then bake for the remainder of the cooking time. I will hopefully get to the pie this afternoon. 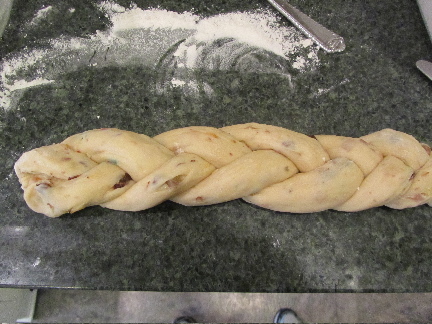 I also baked the Austrian Almond Braid, earlier this week. I wrapped and froze it, to thaw in the morning, and put a glaze on it at the last moment. In case you're interested, here's the recipe. In a large bowl, stir together 1 cup of the flour, sugar, salt and yeast. In a microwaveable container (I just use my large Pyrex measuring cup), heat milk, water and butter for about 1 minute (until the butter becomes very soft, about 120-130 degrees F). Stir together. allow to cool slightly. 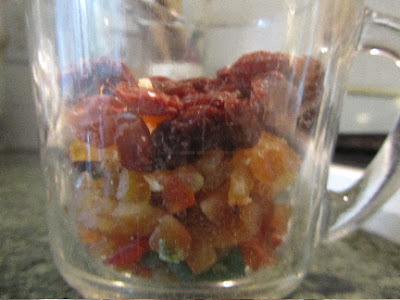 Pour the liquids over the dry ingredients, and beat well, until smooth. In a small bowl, beat the egg with the almond extract. Add to the dough, and stir well. Mix in 1/2 cup of flour. Add the dried/candied fruit and almonds. Add more flour to make a soft dough. Turn out onto a lightly floured counter or board and knead until smooth and satiny, about 5-10 minutes. Cover dough, and allow to rest for 20 minutes. 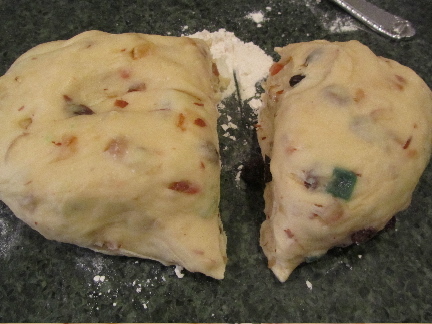 Divide dough into 2 parts, one 2/3 of the dough, the other 1/3. 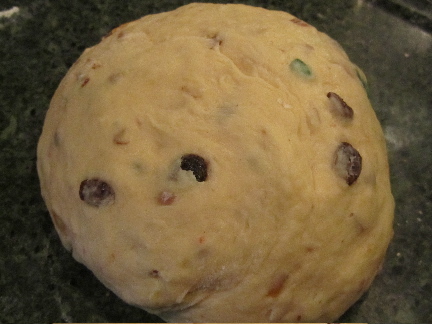 With the 2/3 dough, divide this into 3 parts. Roll each part into a long strand, about 15 inches long. Lay the 3 strands out side by side, and pinch one end of the 3 strands together. Braid these strands. Pinch the bottom ends of the braid together. Place on a buttered baking sheet. 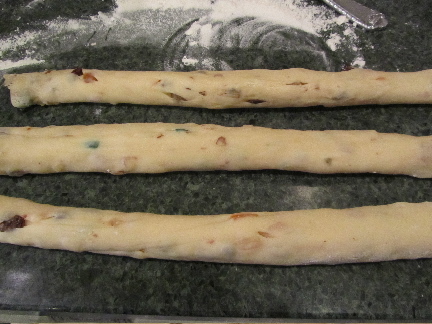 Take the 1/3 dough and divide into 3 parts, roll into strands about 18 inches long. Braid these 3, pinching both ends of braid. Lay on top of the large braid and tuck the ends of the small braid under the large braid ends. For a soft crust, brush with oil. But truthfully, I never bother with this step -- too much work. 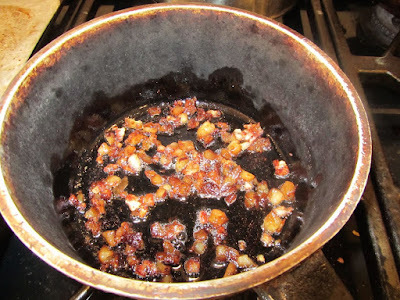 Cover with a towel and set in a warm place (80 to 85 degrees F) to rise until doubled, anywhere from 45 minutes to 1 hour. Bake in a preheated oven, at 350 degrees F, for 25 to 30 minutes, or until golden. Remove to a cooling rack. Once cool, glaze with Almond Icing. Decorate with additional chopped almonds, if desired. In a small bowl, stir all together until smooth. What a deliciously yummy Easter at your house! wishing you a fabulous weekend in the garden too. Happy Easter, Jayne! May your weekend be fabulous as well! Happy Easter to you and your family Lili. Hope all your pre-planning will pay off and you'll have relaxing time. Happy Easter, Sarah! Sending Easter blessings for you and your family! I hope you get a warming trend, soon! We're having a simple meal of fried chicken, baked mac and cheese, green beans and chocolate cake. Nothing fancy, but what the gang requested. 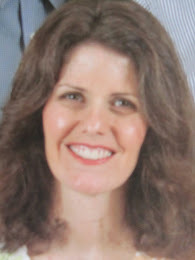 Happy Easter, Shara! Your menu sounds delicious! I would sure love to learn to make fried chicken. And I know my family would be happy if I learned, too! have a wonderful weekend with your family! I too love to hear what others are eating and their traditions. We are having a family get together today instead of tomorrow because of scheduling reasons. We are having a green salad, quinoa-lentil dish, ham, corn, and Easter sweet bread, and root beer floats for dessert. Everyone is bringing their specialties. Any family meals on this side of the family are usually very elaborate with tons of food. We're trying to scale back this year so we can have more time for visiting. We'll see if that happens. Some how the food usually just keeps coming. Now, I'm off to check the ham. Happy Easter, live and learn! Your menu sounds yummy! Is your quinoa-lentil dish a hot or cold one? I hope this time with family is extra special this year. Quinoa dish was a cold salad with tomatoes, cucumbers, onion, garlic, parsley, and lemon juice and olive oil. Just the kind of thing I love. Okay, it sounds a lot like tabouli. I love marinated grain and vegetable salads. They are something I eagerly anticipate as the garden progresses. Hope you enjoyed your time with family today! 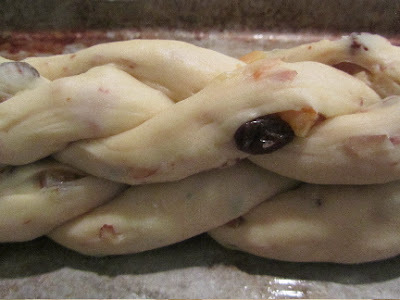 You have made my mouth water with this Almond Braid recipe! Your house is going to smell so wonderful for several days! You are treating your family to some lovely meals! Wow!! Wishing you a wonderful Easter!! Thank you! I will be falling asleep to the dreams of yummy Easter meals. Have a lovely Easter, Jemma! Wow, that bread is beautiful, Lili! I love that you braided it. I'd say it tastes great as well. I love to read other people's menus. Your Easter brunch and dinner menus sound delicious. I hope you and your family have a blessed holiday celebration. I know, there's something about reading what someone else is cooking that is so appealing! We will be having brunch at church tomorrow. 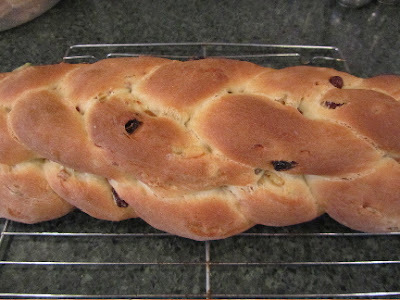 I had toyed with doing a sweet cream braid bread (we must have braids on the brain!) but decided instead to use up some of the ridiculous amounts of cranberries in my freezer (WHY did I buy so many last fall? ), so we have orange/cranberry bread to contribute. Wow! What a nice idea for the meringues. I am certain that your cranberry-orange bread will be devoured and enjoyed fully! The brunch at church sounds like it will be a fun time! I wish you and your family a lovely Easter. That's great that you're planting some kale. Fresh kale tastes better than stuff that's been in the market for a few days. Kale can tolerate a bit of shade, likes lots of water and is sweeter after a frost. Good luck with it!